Huge deliberate call goes against Tigers Was Richmond stiff on this decision in the dying seconds? THE CONTENTIOUS deliberate out-of-bounds rule has been "important to the quality of football", says AFL CEO Gillon McLachlan after another weekend of confusion surrounding its interpretation. The rule came under fire again at the weekend in decisions involving Greater Western Sydney's Callan Ward and Richmond's Jayden Short. 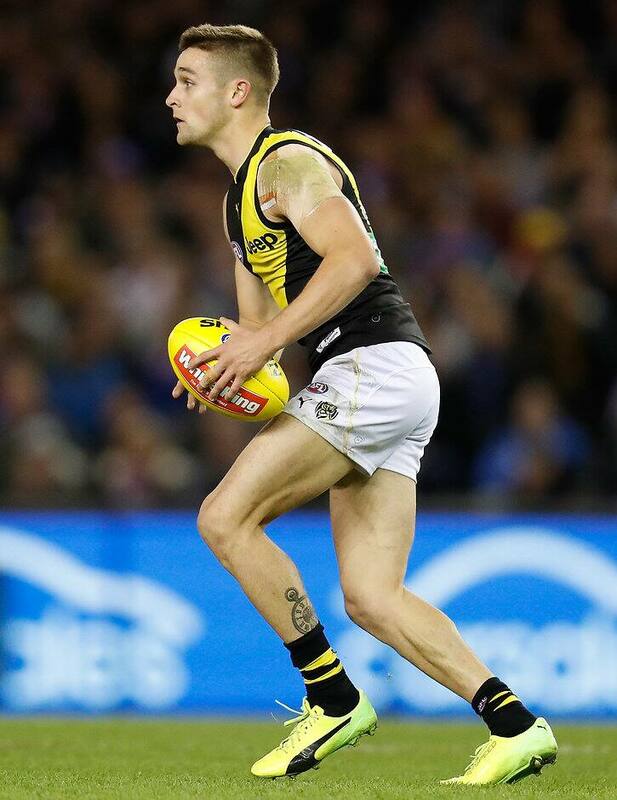 Short was penalised in the dying stages of Saturday night's five-point loss to the Western Bulldogs when he fumbled the ball over the line, a decision McLachlan indicated was wrong. "When I first saw it, I thought it was deliberate but when you look close in slow motion, he fumbled it," McLachlan said on Monday, at the launch of the Country Festival that will feature Saturday night's Essendon-Geelong match as its showpiece. "It's a tough job, umpiring." But while McLachlan acknowledged there were "a couple of mistakes" across round seven, the game was better for the shift in the rule. "I think we are not talking about the important role the rule changes have made to the quality of the game," he said. "The football is exceptional at the moment: high-scoring, entertaining, the crowds are fantastic and the ratings are fantastic. "I want to congratulate the boldness of the rules committee to make the changes they have to keep our game relevant to everyone in 2017. "When you make change, there's always challenges with that but I think the rule has been important to the quality of footy." He added that he believed there was a "solid expectation" on how the rule was interpreted, and that people generally understood it. On Saturday night, Bulldogs coach Luke Beveridge compared its application to an episode of 1970s sitcom Fawlty Towers, after the League last week re-framed its language around the rule to include the words "insufficient intent". But McLachlan maintained the game was in excellent shape. "I think that it was an extraordinary weekend of football, the first time since 1975 that every team who was low-ranked in each game beat the high-ranked team," he said. "Football is going really well, so in the absence of other noise, we focus on two mistakes. "There is always some mistakes, and I think the respect for umpires is an incredibly important part of our game at a community level and the elite level. They do a very tough job. "I think that the umpiring was excellent on the weekend."